The 8th SANEC-SADC Ambassadors Luncheon has come to an end and as expected it proved to be an ideal occasion for promoting trade and investment within the 15 Southern African countries. Consequently, in a true SANEC spirit the SADC Ambassadors Luncheon commemorated our 25th year Anniversary of facilitating international trade and cooperation between The Netherlands, The Southern African and The Benelux region as reflected upon by the SANEC Chairman, Mr. Frans Engering in his welcoming address. However, we could not have achieved this if it was not for the respectful sponsors, esteemed speakers and the honourable Ambassadors, as well as, the diverse attendees who through the joined participation developed an informative, communicative and beneficial afternoon for all those present. This year we were delighted to welcome the Chair of the SADC Ambassadors and an Ambassador himself, H.E. Mr. Samuel Outlule as our Keynote Speaker, who took the floor to discuss the steps taken by the SADC Governments in the creation of prosperous investment environment for investors across the SADC region. This was further built upon by the three afternoon speakers, namely, Mr. John Young, the Chief Executive Officer of Twisters B.V. speaking of Internalization and Business Opportunities in Africa and the EU, Mr. Marco Rensma, an International Marketing Lecturer and Coordinator at The Hague University, who elaborated on the Africa Business Program incentive, and the General Manager of Turkish Airlines, Mr. Cengiz Inceosman who discussed the Turkish Airlines expansion into Africa. Not to mention that the Turkish Airlines extended a notable generosity to SANEC by offering a free business class ticket to one lucky winner through the lucky draw that was held right before heading into the formal Match-Making Session. We would like to extend a special thank-you to Mr. Andre Loozekoot, the Coordinator at the Netherlands Ministry of Foreign Affairs and who soon will be stationed at the Dutch Embassy in South Africa, for his presence at the business luncheon. 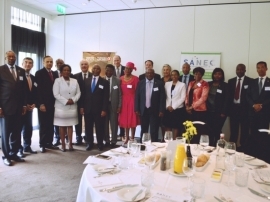 We would like to thank our board members and our distinguished guests for their participation, and we are looking forward to welcoming all of those present next year for another stimulating Ambassadors Luncheon to meet the SADC Ambassadors, explore themes relating to doing business in Southern Africa, as well as, connect with other members, network and build prosperous future partnerships. For pictures from the SADC Ambassadors Luncheon please click here.